The Hollywood sign is one of California's most iconic landmarks. 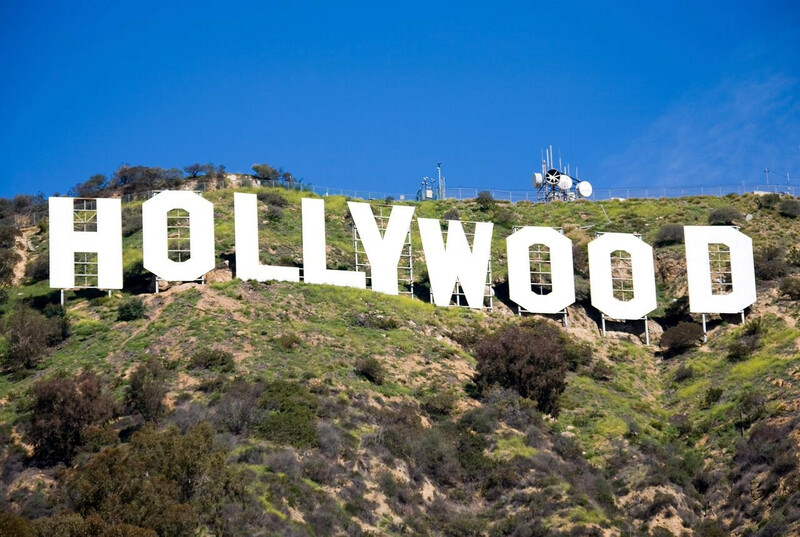 When people think of Hollywood, the first thing they might imagine is the sign, its crisp white letters overlooking the city, beckoning would-be movie stars to take their chance at stardom. But it wasn't always this way, and the sign has undergone numerous changes throughout the years. Erected in 1923, the original Hollywood sign actually said “HOLLYWOODLAND.” Los Angeles Times publisher Harry Chandler had built it as a billboard advertising his upscale real estate development. The 45-foot-high, white block letters were anchored to telephone poles and illuminated by 4,000 20-watt bulbs, spaced eight inches apart. Much like a Las Vegas billboard, the sign lit up in four stages: “HOLLY” “WOOD” “LAND,” then the entire word. It was only supposed to be up for a year and a half, but has instead stood for over eight decades. However, because the sign was only supposed to have been up for 18 months, exposure to the elements wore away at the wood and steel. Regular maintenance stopped when the Hollywoodland real estate development went under during the Great Depression. There was also an incident in the early 1940s where the sign’s official caretaker, Albert Kothe, drove into the “H” while inebriated, destroying it. While the housing development plans went bust, there were others who had plans for the land around the Hollywood sign. In 1940, eccentric business tycoon Howard Hughes bought 138 acres west of the sign with plans of building a mansion for himself and then-girlfriend, actress Ginger Rogers. However, when she broke up with him those plans were scrapped. The 1949 restoration efforts helped for a little while, but the sign’s unprotected wood and steel frame could not withstand the elements, leaving it a rusted, dilapidated mess by the end of the ‘60s, an unfortunate reflection of Hollywood itself at the time. Numerous pranks were pulled using the sign. On January 1st, 1976, Danny Finegood, a student from Cal State Northridge, used black and white fabric to alter the sign to read “HOLLYWEED.” This was to celebrate a state law that had passed decriminalizing the possession of small amounts of marijuana. He was also responsible for changing the sign to say “HOLYWOOD” that Easter. Other acts of vandalism and citizens dangling themselves from the letters have since prohibited public access to the site. Because of this, the sign finally had the funding for an overhaul, with the old sign scrapped in August ’78. After three months, the new sign was revealed on November 11, 1978, as the finale of a live CBS television special commemorating the city’s 75th anniversary. The new sign was the same size as the old one but had structural improvements such as steel footings rather than telephone poles. The letters were once again white, though there were no lights, unlike the original. Since its rebirth, the Hollywood sign has maintained its upkeep, with new coats of paint in 1995 and 2005. To prevent acts of vandalism such as that of the ‘60s and ‘70s, security cameras, microphones, a razor-wire fence, and motion sensors have been installed. Those interested in visiting the sign can see it from two viewing platforms: Griffith Observatory and the Hollywood and Highland Center. In 2002, Howard Hugh’s estate, which had done nothing with the land since the tycoon’s break-up, sold the 138 acres to a Chicago-based investment firm. The firm planned to build luxury mansions along the ridgeline, putting the property on the market in 2008. Environmentalists were concerned about the development, so in April 2009 The Trust for Public Land signed an option to buy the land for a discounted $12.5 million. Like with the restoration in 1978, a number of movie studios, actors, and foundations banded together to raise the money. The sign itself was covered with banners reading “Save the Peak” to encourage donations. Once again, Hefner was instrumental to protecting the integrity of the sign, donating the final $900,000 in April 2010, allowing it to become protected parkland. 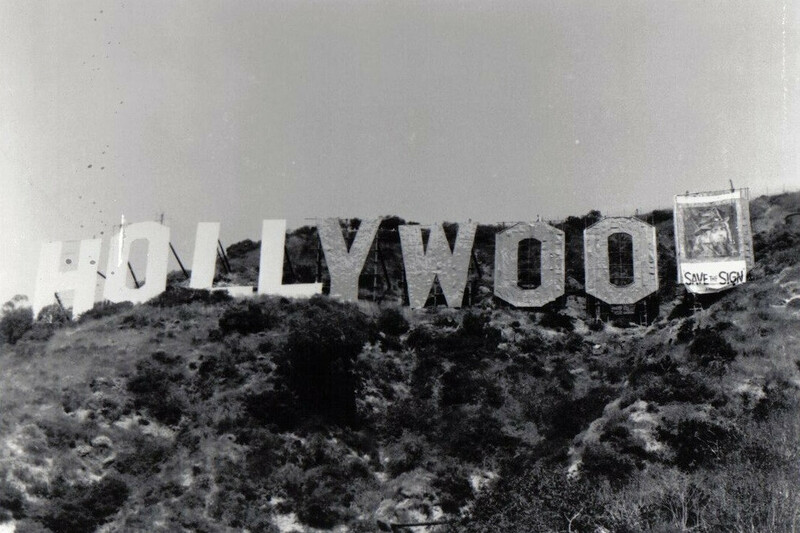 Historic Photos Courtesy of HollywoodPhotographs.com and the Hollywood Sign Trust. All Rights Reserved. 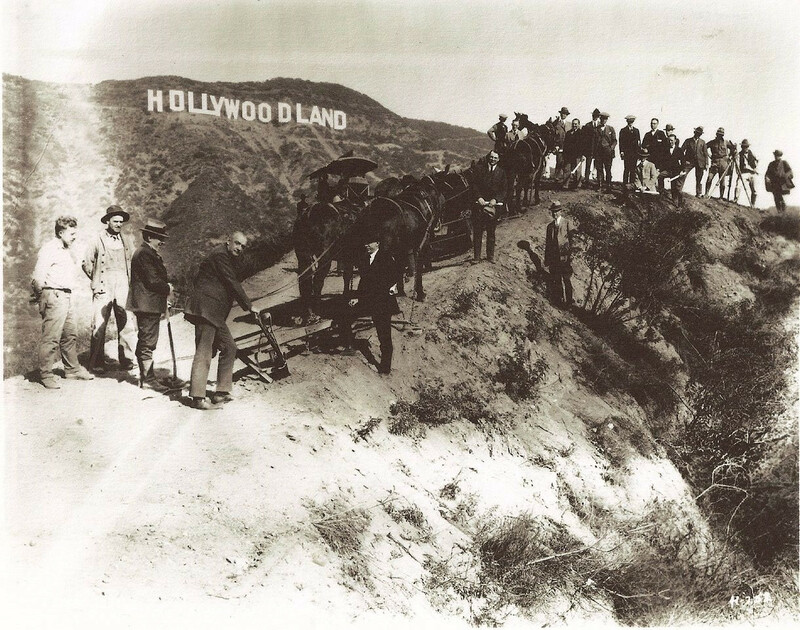 Present Day Photos Courtesy of the Hollywood Sign Trust. All Rights Reserved.